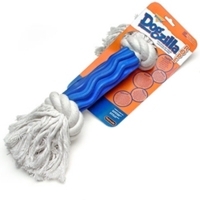 Dogzilla® Rope combines durable cotton rope with Dogzilla rubber to create a fun chewing experience with different textures. 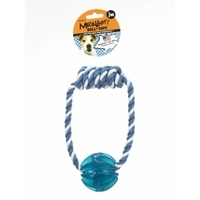 The Dogzilla rubber is infused with protein and appeals to your dog’s 5 senses while the rope helps clean your dog’s teeth and gums. Available in a variety of sizes perfect for a dog of any size. 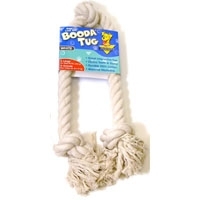 With Booda® Fresh N ‘ Floss®, you can finally get your dog to floss on his own! 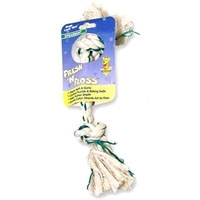 This one-of-a-kind rope combines durable cotton with mint-scented “floss” for a unique twist on one of the most popular games between you and your dog. Features fresh-tasting baking soda and wax coated nylon strands to fight plaque and control tartar. Fresh N’ Floss is non-invasive, non-irritating and sensitive to mouths and gums. Available in a variety of fun shapes, flavors and sizes. 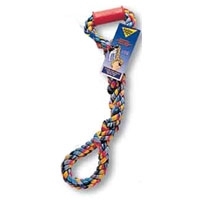 A handy addition to an old favorite, the BOODA Wonder TugTM is a rope bone equipped with a sturdy, comfort-grip, rubber handle that lets you and your dog enjoy safe and controlled exercise. Wonder Tugs come in a solo tug for interactive play and a twin tug for play with two dogs. Wonder Tugs are made from a machine washable cotton blend." 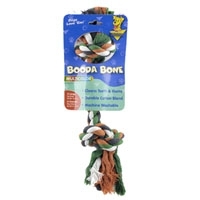 Booda® Rope Bones can be used for interactive play or as solo dog chews. 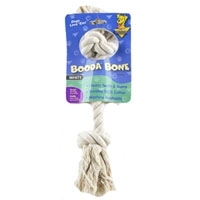 These natural cotton bones are a fun and easy way to floss your dog’s gums and help prevent dental disease. Feature machine washable, tightly twisted cotton for long-lasting durability. Available in two-knot or three-knot designs and in a variety of sizes.